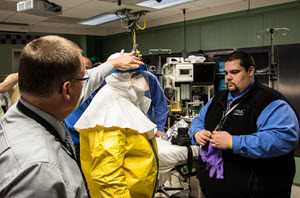 As Pittsburgh and Southwestern Pennsylvania prepares for the potential of caring for patients infected with Ebola, WISER has taken the lead in helping train relevant staff members. Recently, UPMC PreHospital Care staff filmed a variety of different donning and doffing techniques for Ebola preparedness training. These videos will be used to train PreHospital care workers at UPMC. WISER along with UPMC is committed to providing the best possible care to its patients and ensure the safety of the employees and surrounding individuals.